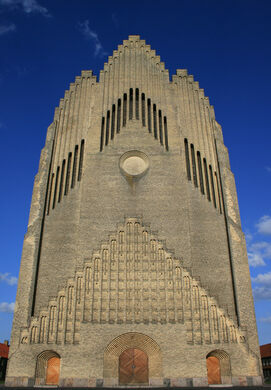 Located just outside Copenhagen, this monumental Gothic-style church is one of the most distinctive in the city. Indeed, it looks unlike any other church in the world. More than 6 million yellow bricks form a serene, minimalist look, juxtaposed with a soaring facade that evokes the shape of a church organ. 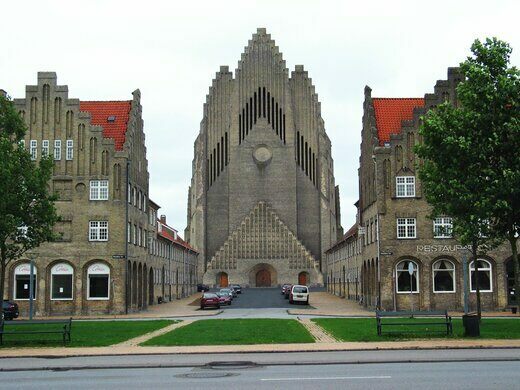 Grundtvig’s Church was built to honor N.F.S. Grundtvig, a 19th-century Danish philosopher, historian, poet, and reformer. 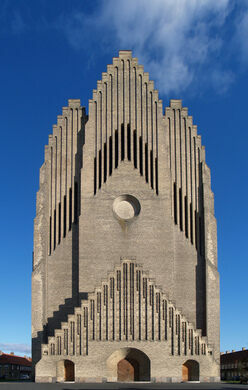 His influential ideas earned him a monument in his name, designed by master architect Peder Vilhelm Jensen-Klint shortly after World War I. 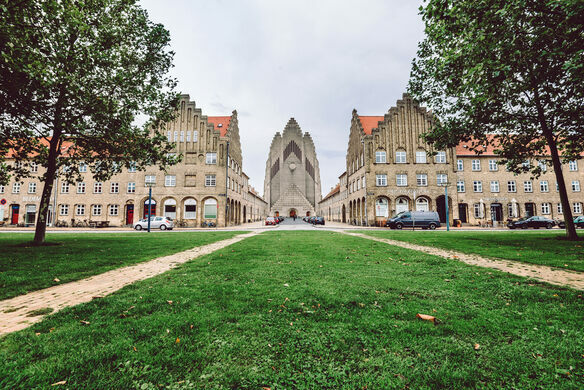 The design is meant to be a synthesis of numerous building styles, merging the scale of Gothic vertical architecture with geometric expressionism and traditional Danish styles. 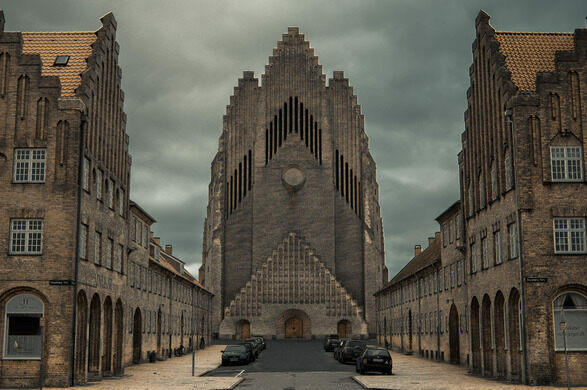 Inspired by Grundtvig’s work, Jensen-Klint based the design primarily on the stepped gabled churches found in the local villages, but on a far grander scale. 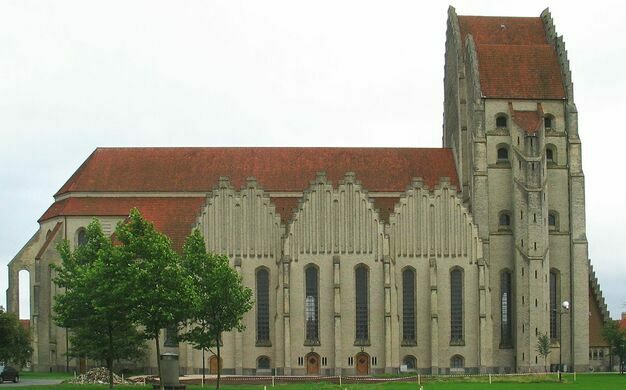 The massive church is 259 feet long with the nave soaring 72 feet high. 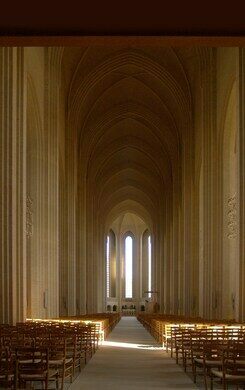 The interior can hold about as many people as Copenhagen Cathedral. 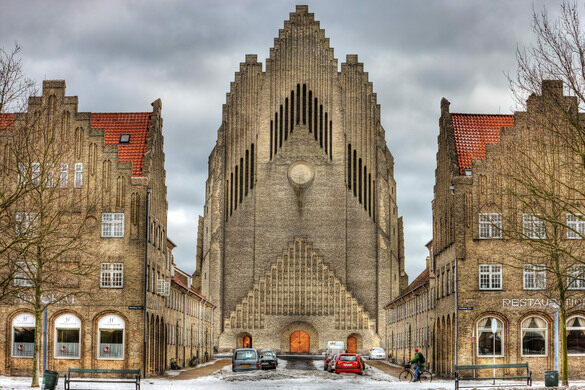 To balance the Gothic proportions of the interior, more than 6 million yellow bricks, a traditional Danish material, were uniformly used in keeping with classic Danish minimalism. The yellow color was chosen to represent ascension, literally and spiritually, and indeed, the church seems to be ever-reaching toward the Sun. A universal meditative place of worship and social justice center adorned with paintings by famed abstract artist Mark Rothko.